Are you a student and looking for the 9th Class Maths notes with solutions for all the chapters? These notes are made for the FBISE students. Most of the Pakistani students consider mathematics a difficult subject because they take this subject like other subjects - parrot fashioning (Ratta'lization). The best way is to practice as much as possible. Revise theorems every day because they are more likely to be forgotten. Revising every day makes sense. When you memorize a topic, the next day about 20 to 30% fades away from your mind. It is important to revise every day. Doesn't it take a lot of time? Nope! It is not! When you revise a topic every day, the topic takes less time. Your eyes remember the pattern, and the words written on the book. A lot of students seriously no idea why maths is being taught because it has no knowledge, according to them, as it is the case with Biology, Chemistry, and Physics. The science subjects mentioned above provide you insight to the inner and outer world. Biology tells you about the living things, and Physics shows you where an airplane flies in the sky. It enhances your rational and logical thinking that is normally considered in the test like DMCAT, CSS, SAT, and NTS in the future. You can think great, and you can solve a problem of your life well just by using a little brain. Here are all the chapters 17 of 9th Class Mathematics, you can download or view online without downloading anything. 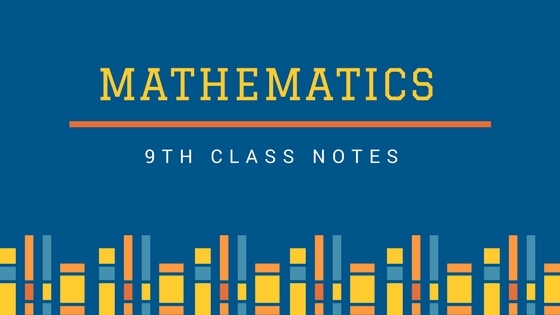 Here are the notes for 9th Class Maths in PDF for Federal Board for ALL CHAPTERS, and even you can download or view online without downloading anything. The best notes you can ever get.